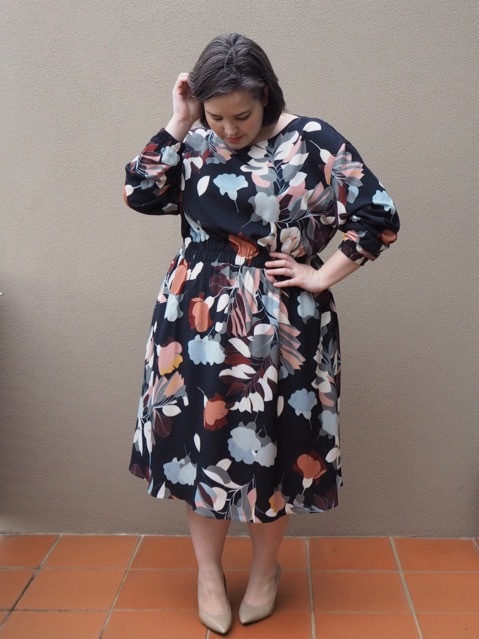 So, because my blogging has been so sporadic lately, I’ve been falling into this trap of buying something, wearing it, loving it, then posting about it three months after it’s disappeared from the shops. It’s Annoying and Bad Blogger Behaviour and I’m trying to Do Better, which is why you’re getting three OOTD’s in one post today. I’ve been pretty good about being sensible about money lately. Working full-time out of an office has done wonders for my incidental spending, and, as you know, I’ve been doing a lot of sewing instead of shopping; but in the lead up to my 40th (cripes!) birthday I went on a bit of a binge, so I thought I’d share the spoils. 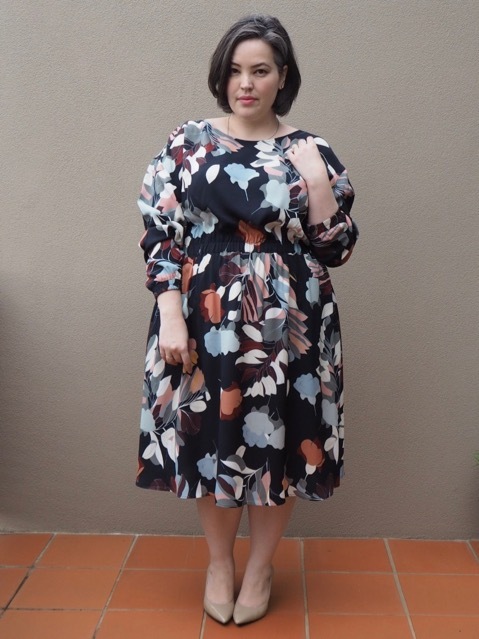 First up is this autumnal dress from – unexpectedly – Country Road. It’s been a while since I ventured into Country Road. There’s one quite near my office, so I wander past on a daily basis, but they only go up to a size 16, and these days I have to really really love something to take it into the changeroom and risk being disappointed when the largest size doesn’t fit. I really really loved this dress, or rather I really really loved the print. It’s all orange and navy and blush and unexpected pops of mustard, and it’s big, bold floral that drew my eye every time I saw it. 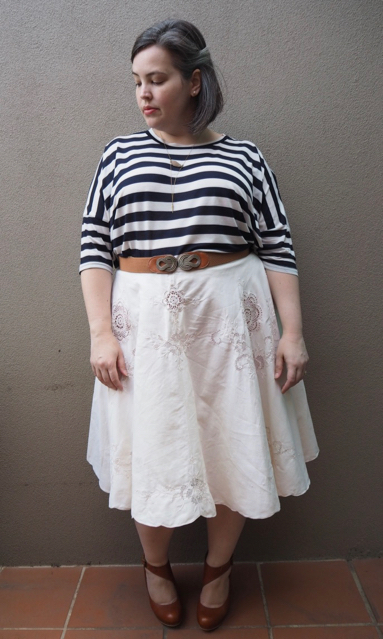 With the gathered skirt, and blousy top I thought that there was a slight chance it might be oversized enough to fit, and that worst-case scenario, I might be able to dismantle the dress and fathack the fabric into something new. Imagine my delight when I realised that gathered waistband was elasticised, as were the cuffs on the balloon sleeves. And imagine how pleased I was when I discovered it had deep, functional pockets. Now try to imagine me not buying it when – against all odds – it actually fit beautifully. It’s a fairly light rayon/viscose fabric, unlined, which means that while I can wear it now with tights and a long cardigan (or with lots of layers of thermals underneath), it should also do me well right into spring, and hopefully into next autumn as well. 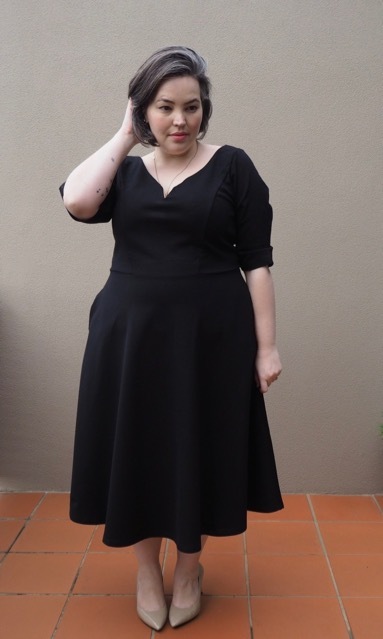 Also new in my wardrobe is this black midi dress that I definitely didn’t need from City Chic. 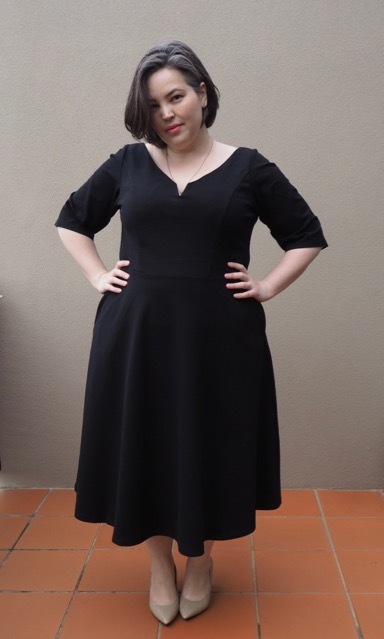 I’m a sucker for sleeved dresses and wide necklines, and this dress is a beauty. 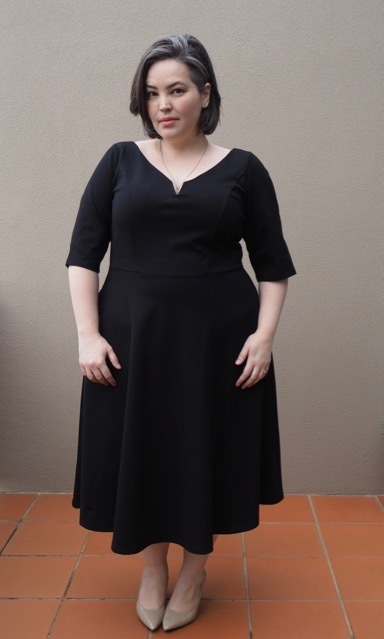 It’s, admittedly, not the only plain black dress to hang in my wardrobe (it’s not even the only midi-length, sleeved, plain black dress with a full skirt to hang in my wardrobe) but at under $100 it’s a steal. There’s a sleeveless version available in City Chic shops right now, but this sleeved version is an online exclusive. Made from a heavy ponti jersey, it’s a classy, versatile dress with a princess-seamed bodice, and a full skater-style skirt that boasts – you guessed it – pockets. It’s probably just a smidge too long, and the sleeves are baggier than I’d like, but it’s wonderfully elegant and comfortable to boot. 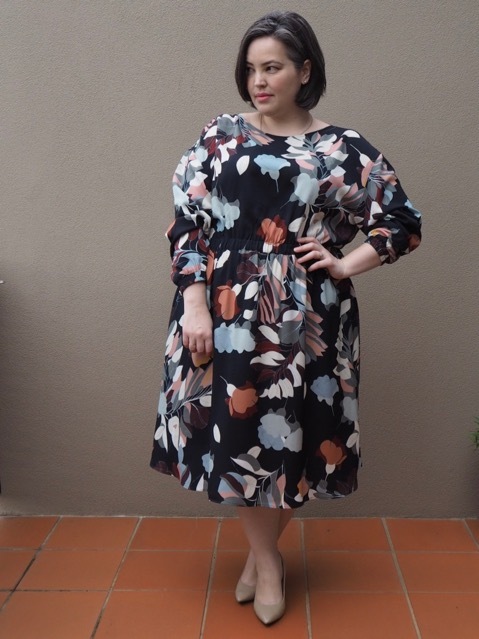 I thought it might make a good oh-god-I-don’t-know-what-to-wear-today dress (which it does) but it also has a notch neckline that’s wired to hold its shape, that gives spectacular cleavage, so watch out for that if you work somewhere a bit conservative. Last year, I discovered to my horror that not only were clothing moths not a myth cooked up by Big Wood to sell cedar balls, but that somehow I’d managed to be afflicted with them. I lost pretty much my entire knitwear collection in one fell swoop (including all of my cashmere, *cries forever*), and I’ve been gradually trying to rebuild my winter woolies since then. One thing that I was particularly devastated to lose was a long merino coatigan that I wore almost every day the winter previously. 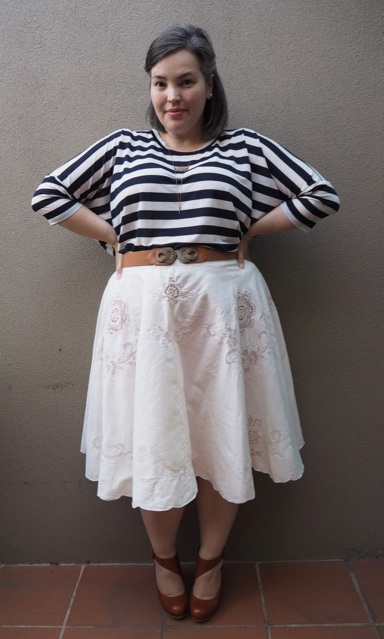 It was perfect for layering over skirts and dresses, as well as jeans and trousers. It was light enough that I could wear it indoors if I was feeling cold, but warm enough that I could wear it as a jacket outdoors as well. I haven’t had any luck replacing it, but this “coat” from Seed is a worthy successor. Seed‘s another of those shops I don’t venture into very often. I don’t have kids, and Seed only goes up to a size 14, so I don’t have a lot of excuses to darken their doors, but I’ve recently discovered the joy of triangle scarves, and Seed struck me as somewhere that might have them. 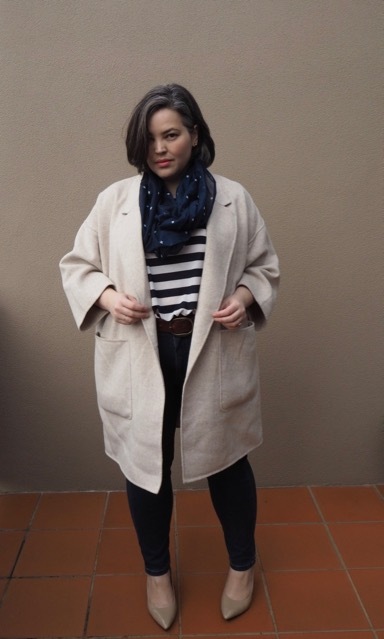 They don’t, but they did have this oversized oatmeal coat on sale, and I kinda… love it. It’s only a wool blend, but it’s unexpectedly warm, and it has the dropped shoulders that I’m super into at the moment, and pockets big enough that I can stash my iPad in them. In no way shape or form is it worth its original price of $339. It’s not even lined, so realistically it’s not really even worth the $174 that I paid for it, but I’ve worn it almost every day since I bought it so it’s definitely earning its keep. It’s the perfect length for layering, and teamed with skinny jeans it gives a really stylish vibe. I’ve teamed it today with high-waisted denim jeans from Svoboda, who – tragically – are planning to close their virtual doors. 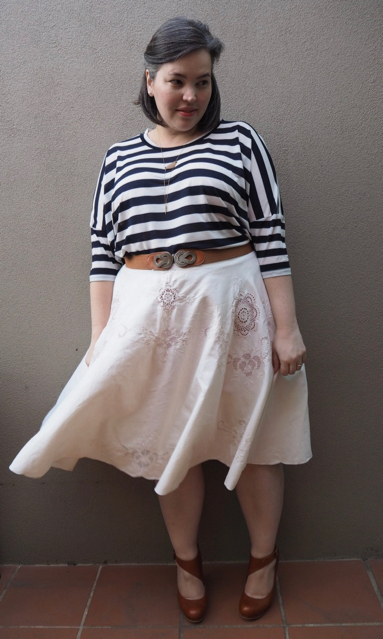 I blogged about Svoboda way, way back in the early days of Frocks and Frou Frou. 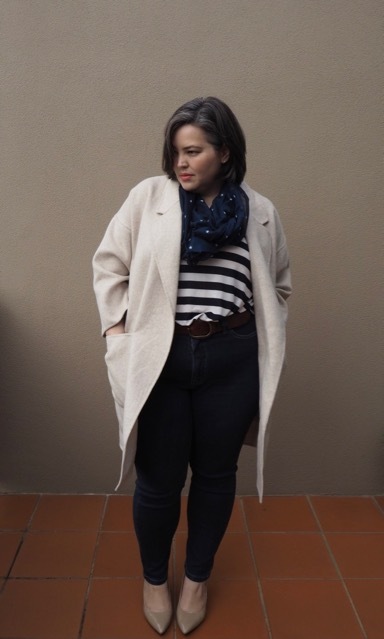 They were one of the very first premium denim brands designed for the plus-size market, and it’s very sad to hear that their current line will be their last. These skinny jeans are super comfortable. Svoboda ran a campaign with them with plus-size women doing yoga, and that’s not an exaggeration – I could comfortably do a full sun salutation in these without batting an eyelid. They looked way too small to fit when they arrived, but the fabric stretches beautifully without bagging. They’re a true skinny without being so thin that you feel like they reveals all those bumps that you’d rather not flaunt. I sized down on Jessica Svoboda’s recommendation, and I’m glad that I did. The fly pulls a little at my tummy, but apart from that these are just wonderful, and I’m definitely going to grab a few more pairs before they disappear forever. Been a while since I did a remix, huh? 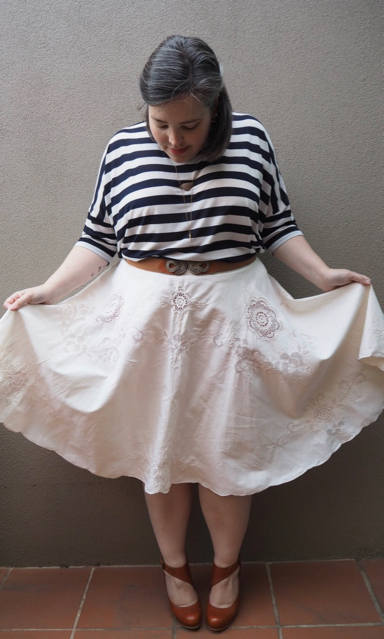 This is actually a bit of a remix, and bit of a DIY: it’s an old embroidered tablecloth that I’ve re-purposed into skirt. 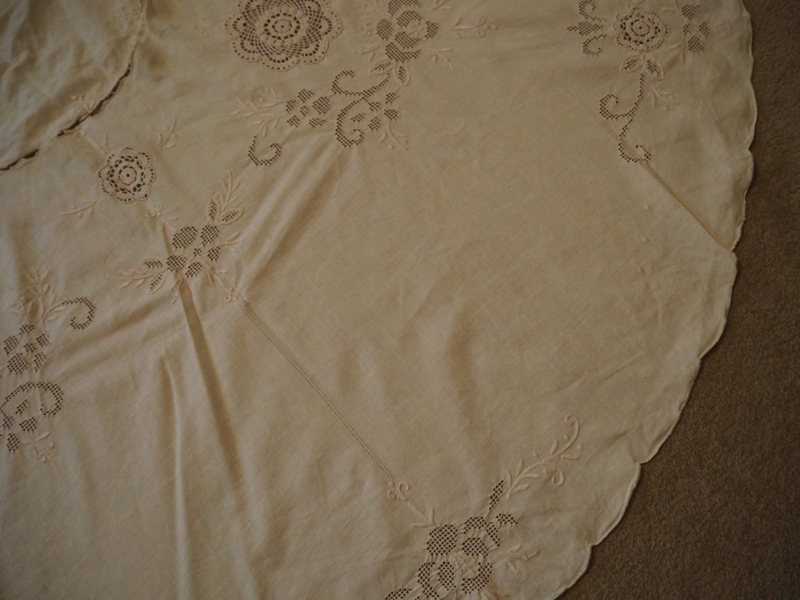 I found this big circular tablecloth at a trash and treasure market, and really loved the embroidery and scalloped hem. The cotton has that lovely softness that you get with fabrics that have been well-used and, the colour is a pretty apricot-tinged blush. I thought it would be an easy project, and it really is! To start with, you have to figure out where to cut the hole for your waist. The easiest way to do this is to measure the diameter of your waist (plus maybe an inch for seams) then divide that number by 6.28 (because, math). 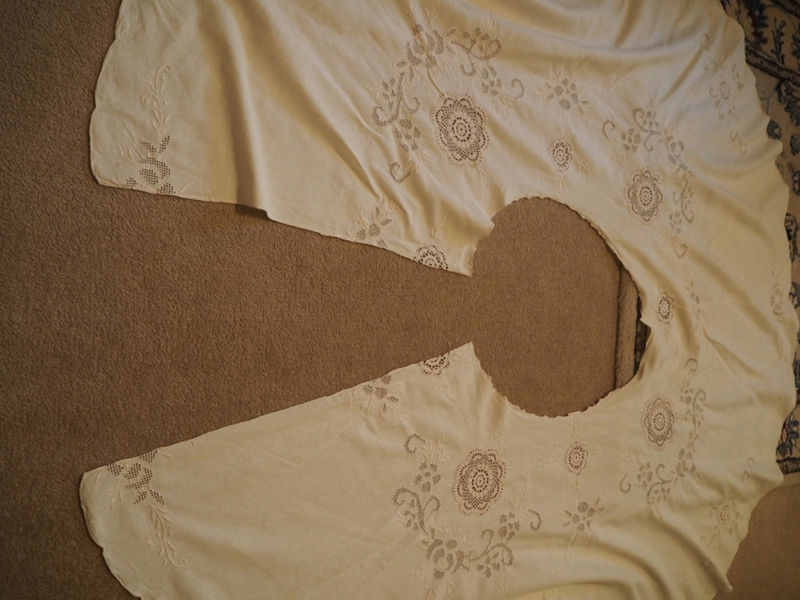 Now fold the tablecloth into quarters and measure that number from the point at the top of the pie piece (I used a bit of string at that length to mark where to cut). 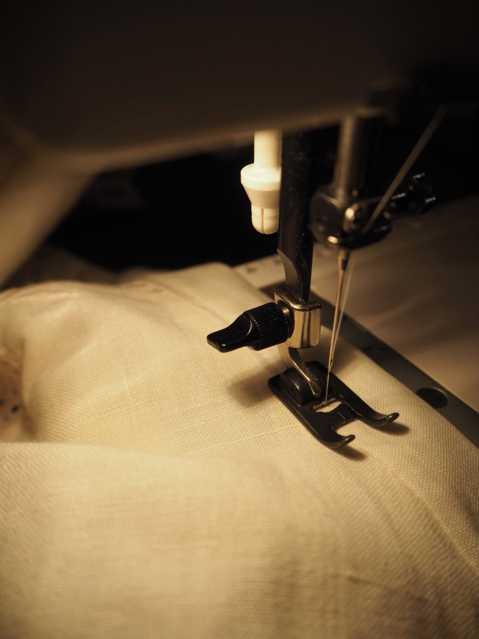 Once you’ve cut the hole for your waist you should cut a line up the back – this is where you’ll insert your zipper. Next, you want to find some fabric that more or less matches the colour of the tablecloth so that you can make a waistband. 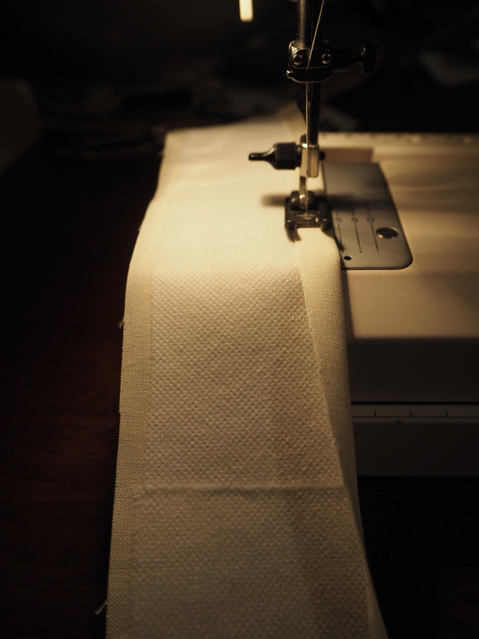 Cut a long strip about three inches wide, and about an inch longer than your waist measurement. 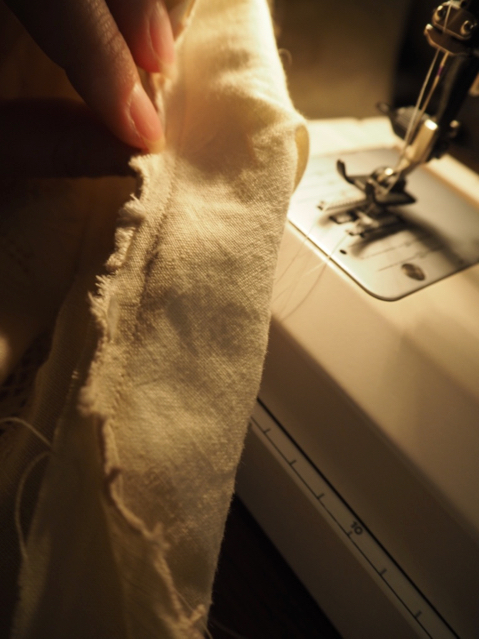 Apply some interfacing, then fold one long edge up and stitch it into place. Right sides together, pin the waistband to the waist of the skirt – with the raw edge matching up to the fabric of the skirt – and stitch. 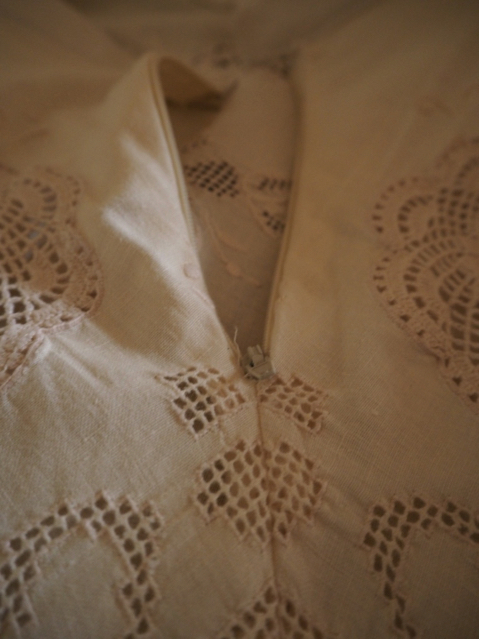 Now insert the zipper, and stitch close the back seam. I haven’t included instructions for this step, since – to be honest – every time I insert a zipper it feels a bit like I’m making it up as I go along. Are there different rules for different kinds of zippers? I’m pretty sure they are. Insert the zipper according to the instructions on the packet, I guess. 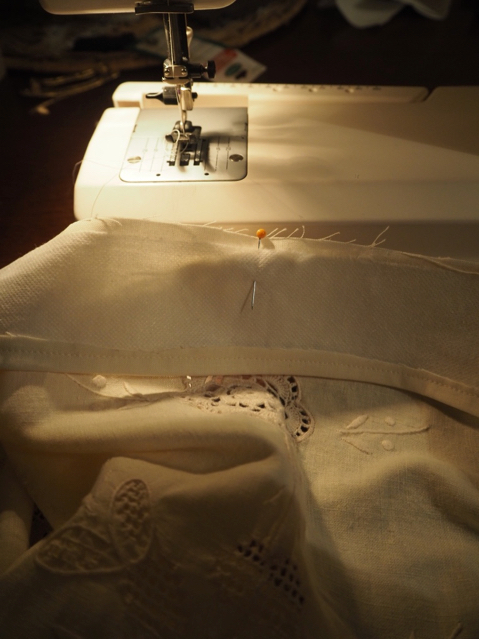 Once your zipper is in, press the raw edge of the skirt waist up into towards the waistband, and fold the finished edge of the waistband over it. Pin it in place, and give it another press, just to make sure you’ve got a nice clean edge. Does this photo show that? Who knows? It was very late by this point.